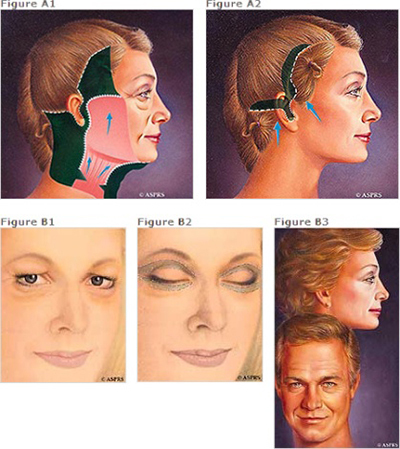 A Facelift, or rhytidectomy, is one of the most popular plastic surgery techniques available today. This treatment reverses the effects of time and aging on the face. If you are noticing jowls and lax skin in your neck, and the corners of your mouth are sagging then you may be considering a facelift. When young, the face is full and smooth but as we age the skin and muscles sag. Heredity, lifestyle habits, gravity and sun exposure all play a part. A Facelift reverses the appearance of aging by lifting and tightening the skin, muscle, and soft tissue, restoring a younger appearance. A Facelift tightens facial muscles and skin using small incisions usually made behind the ears. Excess tissue is removed, and remaining tissue is pulled taught. Tissues beneath the skin are expertly repositioned, and fine sutures reconnect the skin at the hairline and behind the ears. The surgery ultimately removes wrinkles and hanging skin from the cheeks, jowls, and neck. It gives patients a more youthful, wakeful appearance. Patients are given a general anesthesia during their facelift. After awaking following surgery, they will be given pain medication and will have their faces wrapped with special bandages to protect their incisions as they heal. Dr. Lee closely monitors each patient following surgery. Dr. Richard Lee’s skill and technique typically leave his patients looking 10 years younger and with a very natural appearance. If you are interested in more information on Dr. Richard Lee’s Facelift procedure, please call our office!